In this topsy-turvy world, one thing you can count on is that there will always be scores of new cleaning and beauty products released to the market each year. And most of those are overpriced and so full of chemicals and additives that they are secretly poisoning you and the environment while they do their job (which is fine if they actually work - I mean, I'll do just about anything for very white sheets). But, meanwhile, little did you know that there is a completely non-toxic, inexpensive cleaning and beauty product that has been in the market for years, and that you probably already have in your pantry: Baking Soda. Your grandparents knew that there isn't much this miracle powder can't do around the house (but somehow they forget to pass that info on to you). Here's just a sampling of what it's good for- it's versatility will blow your mind. Oh, and it's good for baking stuff, too. 1. Smell You Later: For some scientific reason I don't entirely understand, baking soda absorbs odors. I explored it's incredible ability to de-stinkify my husband's boat shoes in a post last summer, and it also works to keep your fridge and freezer from smelling too foody (just open the lid of a box and place it on the shelf), can make your pet smell more bearable (just sprinkle it directly on them and brush it through their fur). Or use it to deoderize your garbage can, gym bag, or laundry hamper (just sprinkle directly in there, and wipe out a few hours later), or throw a layer down onto your rugs (then vacuum it up) to make them fresher. Basically, if something stinks, the answer is baking soda. 2. Don't Get Burned: When you accidentally overcook something, and it leaves a burnt-on crusty residue on your pans, you can either spend hours developing carpel tunnel syndrome scouring it off by hand, or you can leave the job to your new friend, baking soda. Simply sprinkle baking soda on the pan, fill it with water, put it on the stove and bring to a boil. The gunk will come right off. This method also works for the rack on your grill (no need to boil, just soak overnight). How does it work? I don't know! Stop questioning the baking soda! 3. Silver Metal: Baking soda works as a gentle silver polish, too. Just mix six tablespoons of baking soda with two tablespoons of water to form a paste. Rub the paste onto the silver with a soft rag, and then rinse. Oooh, shiny! 4. I Feel Pretty: If your hair feels weighed-down with product or artificial color, add a few tablespoons of baking soda to your shampoo to revitalize it. You can also pat some under your arms as a deodorant, use it as toothpaste, use it as a facial scrub, add it to your bathwater to soften your skin, or mix it with water and use it as a mouthwash. Who knew one product could look so good? 5. The Best Medicine: Would you believe me if I told you baking soda can also work medicinally to cure what ails you? Well, it can. Mix a teaspoon of baking soda with water and drink it to relieve heartburn or indigestion, or make a paste with water and rub it on burns and bug bites to take out the sting or the itch. It will also dry out rashes from diapers or poison oak or ivy. 6. You're Fired. 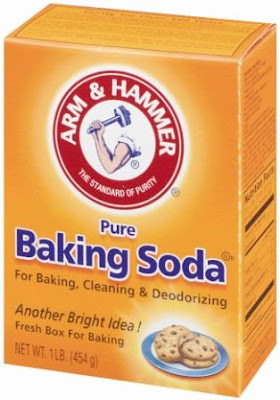 I know what you're thinking- "What else can baking soda do for me?" Don't worry, I'm going to tell you. You can use baking soda to put out small fires from grease, ashes, or candles. Just dump the powder on the flames to extinguish them (using water or trying to smother the fire with a towel might spread the flames). 7. Arrest Pests: Despite how awesome it is, not everyone likes baking soda. Sprinkle it on your window sills or near door jams to repel ants and other bugs. Sprinkle it around your garden plants to repel rabbits and other animals from eating them. Amazing! Who knew? Oh, that's right, you. And it's non-toxic, not smelly and also makes bread rise. Amazing stuff. ALSO- I forgot to mention in the post- it works like a dream to get those coffee and tea stains out of your mugs and teacups. Just make a paste and rub it in.